Indonesian, also known as Bahasa Indonesia, is the official language of Indonesia. Indonesia is a form of Malay, an Austronesian (or Malayo-Polynesian) language, which had been used as a lingua franca in the Indonesian archipelago for centuries. 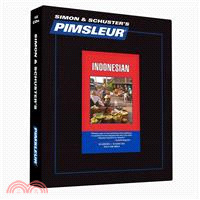 Standard Indonesian pronunciation, which is taught in this course, is based on the language of Jakarta. Indonesian is spoken by nearly 35 million people as a first language and by 150 million people as a second language. It is also spoken in Thailand, East Timor, Sri Lanka, Africa, Philippines, Saudi Arabia, Singapore, Netherlands, and the US. Besides Indonesian, there are over 300 local languages spoken in Indonesia, however, Indonesian is the primary language in education, government, business and communication. Written Indonesian uses the Latin alphabet (like English), there are 26 letters. New thirty 30-minute lessons totaling 15 hours of spoken Indonesian language learning. Plus one hour of Reading Lessons - After an initial introduction to the spoken language, reading instruction is integrated into the program. You'll learn to sound out letters, reading words, phrases, and eventually sentences. Essential grammar and vocabulary – greetings, numbers, ordering food and drink, dealing with currency, scheduling a meal or meeting, giving and asking for directions, going shopping, visiting friends, making plans for the evening, taking trips, organizing transportation and talking about family. Speak comfortably about the past and make plans for the future! Learn to understand much of what you hear, and speak with near-native pronunciation. No mindless repetition! Converse with native speakers in natural (and useful!) conversations at an intermediate level. Easy, fast, fun and effective – We will guarantee your satisfaction and a measurable level of "spoken proficiency" or your money back (rules and regulations apply, see //www.pimsleur.com/Proficiency-Guarantee for more details). Learn anytime, anywhere. No computer necessary!